Comprehensive review of Avene Moisturizing Self Tanning Lotion. See what real experts and actual users have to say about this self tanning product. It seems like lately I’ve tried a lot of sub par self tanners, and this one was no different. I ended up giving this one 2.5 out of 5 stars, so it was very average in my opinion. The color it produced was so light, I’d call it more of a glow than a tan. It was natural and smooth looking, but I think this would work better as a tan extender then as a self tanner. The smell was gross, it smelled like DHA mixed with a slight hint of fragrance. And the price was way too expensive at $7.35 an ounce. 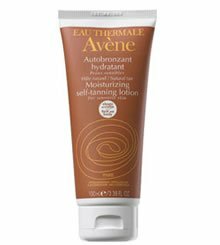 Avene Moisturizing Self Tanning Lotion is a thin, white lotion. The lotion is very slick and creamy, and it’s thinner than most lotions. There’s no guide in it, so it comes out completely white. Avene Moisturizing Self Tanning Lotion is very easy to apply. It comes out white, and you apply it just as you would a body lotion (although I recommend wearing gloves). This one is a little thinner than most lotions so make sure it doesn’t drip. I’d say this one took about 25 minutes to dry completely, which is pretty average. I was a little sticky at first, but the stickiness quickly went away. I would’ve liked it to dry a little quicker, but I can’t complain because 25 minutes is average. This one smells like DHA with a hint of fragrance. It’s not my favorite smell, but I got used to it. It smells of self tanner, but I’ve definitely smelled worse. It smells a little bit fresh, but mostly like self tanner….like I said, not my favorite smell. The next morning any smell was completely gone. I was worried I was going to reek of DHA when I woke up but thankfully I didn’t. This one produced more of a glow than an actual tan. The color I got was very light, but it was pretty natural looking. I’d read a few other reviews that said the exact same thing, it didn’t give them much color at all. This one was a light shade, very even and smooth, and thankfully it wasn’t splotchy or streaky. This one only lasted 2 days before the color was completely gone. I wish it would’ve lasted longer, I feel like this is more of a tan extender than a self tanner. Nope, this one is way too light for men! It also is too expensive and smelly. Avene Moisturizing Self Tanner is $7.35 per ounce….yikes. That’s expensive! The bottle is $25.00 for 3.4 ounces, too expensive for this product. To buy Avene Moisturizing Self Tanning Lotion , Click Here. Look and Feel Very thin, white lotion. Application Application is easy, goes on like a body lotion. Make sure to wear gloves. Drying Time Dried in about 25 minutes which is average. Smell (Before) Smells like DHA and a hint of fragrance, yuck. Smell (After) There was no smell when I woke up the next morning. Color Produced It produced a very light tan, it was more like a glow. How Long It Lasts Lasts about 2 days before the color was completely gone. OK For Men? No, it’s too light, smelly and expensive. Price $7.35 per ounce, thats super expensive, especially for this product.